Moving at the Speed of Creativity | Blog comment moderation: How and Why? Blog comment moderation: How and Why? I posted the following as an entry on my “Technology 4 Teachers” Frequently Asked Questions (FAQ) blog for Spring 2010. 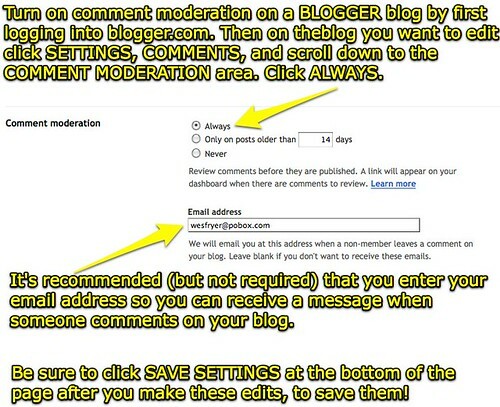 How can I turn on comment moderation on my Blogger blog? Why is this recommended? Prevent cyberbullying: Sometimes people can be mean when they comment online. By turning on moderation, you (as the owner / administrator of your blog) must approve EVERY comment before it shows up “live” for others to see. This can prevent your students from being victims of cyberbullying, including vicious attacks from others. It also can prevent / stave off spam comments. We are using our “Constructive Commenting with Social Media” rubric in Technology 4 Teachers to intentionally encourage an ethic of responsible and respectful blog commenting. Unfortunately not all blog commenters will follow this ethic, but by turning on blog moderation you can PROTECT your students and learning community from those people and/or trolls. Avoid a public relations nightmare: An unmoderated class blog can potentially cause problems. The situation at Owatonna High School (Minnesota) in November 2009 is a case in point. Given the litigious nature of our US society today, it makes sense to moderate posts before they “go live” on your class blog. The last thing you want in setting up and using a class blog is for a post on it to get parents, other students, or your entire community in an uproar. In cases like the one at Owatonna, the “problem” may not be “the blog,” but often people will blame technology in those situations. They also might blame the teacher who did NOT setup comment moderation. Some situations like this might be avoided by turning on comment moderation. If you are using the blog as a TEAM blog, where students also can post, you might want to consider using a blogging tool/platform which lets you MODERATE contributor posts. WordPress does this (and is used by educational blog sites/services like EduBlogs) and so does Class Blogmeister. I’m not sure about Kidblog. Monitor the conversation: If you setup and use a class blog, you have a responsibility and obligation (I would argue) as the teacher to monitor it and “keep the pulse” of the conversations taking place there. By monitoring the comments, you serve as the gatekeeper of conversations there and can more readily monitor what people are saying and WHO is saying them. By default, blogs in Blogger do not allow ANONYMOUS commenting. This is a very good idea. On whatever blogging platform you use, I recommend you do NOT allow anonymous commenting. While people can (on some platforms) still setup an account with a disposable email address and leave a comment, it takes longer to do that and requiring that people be logged in can prevent some “trolls” from leaving unwanted messages on your site. Student writing on blogs can and should be a positive and motivational experience for all concerned. Blog monitoring and moderation is not a guarantee that this goal will be achieved, but it certainly is a pre-requisite. 4 Responses to Blog comment moderation: How and Why? Great advice as always. One thing I’d add is to have a stated comment moderation policy. Having a defined and posted policy helps students and parents know from the start what type of comments will or will not be published. Is it possible to use Blogger now and have students as “contributors,” not authors, so posts can be approved? I am not seeing that option and I thought blogger used to provide it. It may have been an option in the past, but I’ve never seen it in the 2.5 years that I’ve been on Blogger.